Partner with SBSI as a 2019 sponsor! SBSI 2019 is made possible through the generous sponsorship and patronage of partner companies, Duke departments and Fuqua Clubs. Sponsoring SBSI aligns your company with the impact community and allows you to get your logo in front of 500+ conference attendees including business leaders, policymakers, academics, students, and Triangle community members. All sponsors will receive recognition at the event, on the SBSI website, and in advance marketing materials. You will also have a change to interact with talent at one of the world's best business schools as well as network with companies like Patagonia, Sightlife, Elevar Equity, Seventh Generation, and The Bill and Melinda Gates Foundation. Additional perks based on the levels of giving outline below. 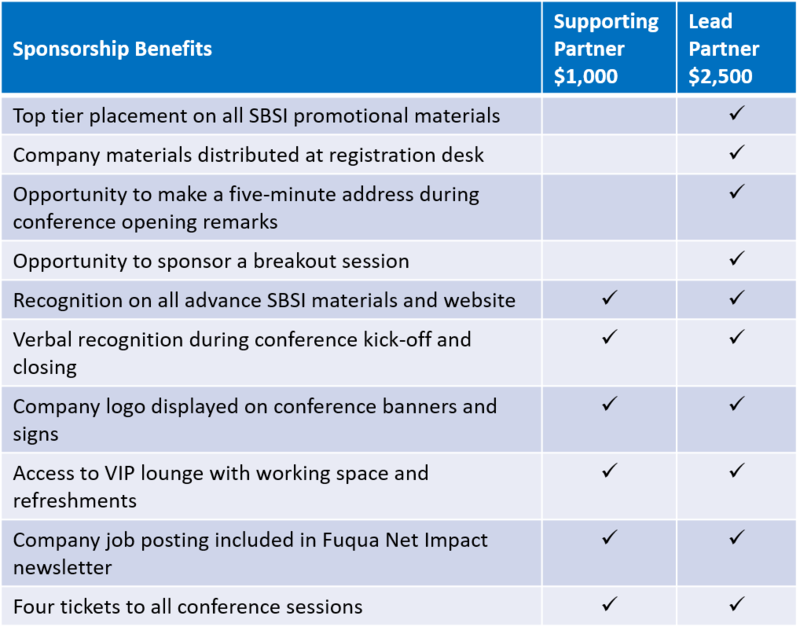 Please refer to the attached table for sponsorship benefits. financial support at this level. If you're interested in becoming a sponsor, please email us at case@fuqua.duke.edu. Customized sponsorships are also available. Email us to discuss options.